Those are the words you long to hear your surgeon say right? “You have the option of Ileostomy Reversal Surgery”? I should be excited to be getting my life back after such a huge change, relieved that I can feel “normal” again.. But I’m not sure I am. This is my life and I do feel normal. In fact I feel amazing. Not physically, of course, but I feel grateful. I’ve had my pain taken away, I’ve had such amazing support and I’ve created a website that I am truly proud of. I feel so much compassion towards my current work and I really feel like it’s helping people. It’s helping me. But I’m beginning to feel a little guilty for even questioning the procedure. Am I being selfish? There’s so many people living with permanent ostomy bags whom I’m sure would’ve loved to have been given the choice. I feel awful for having to think about it. Shouldn’t I be jumping for joy? I mean, when I was told 4 weeks ago that the reversal is an option for me, I felt a sudden rush of relief sink into my body. I left the hospital thinking “it’s just 4 months, I can deal with that”. But now, as I sit in bed feeling somewhat proud of everything I’ve achieved the past couple of days; I wonder if this was my fate all along. Before, I was working as an assistant for a press photo agency. Now, I’m a paid writer starting up my own website. I’m writing about personal experiences, about things that hold such importance within my current lifestyle – it’s everything I’ve ever wanted. I was so lonely before my surgery, I barely saw my friends and family. Now, I’m back home with my family and I have more friends than I’d ever known. People I’d never expected to even wish me well have been there for me. I’ve met so many other people in the same situation experiencing the same things. I’ve been able to openly discuss things other people may find awkward or embarrassing. I’ve been able to smile and laugh. 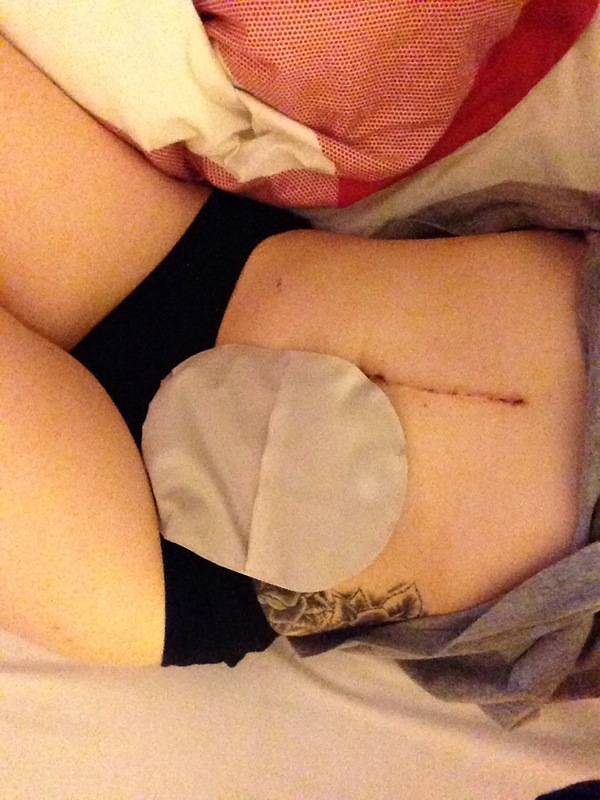 I was scared my boyfriend wouldn’t accept me, or would feel inclined to stay with me because of my ileostomy bag. That he’d feel too guilty to leave if he couldn’t handle it. But he hasn’t changed. He doesn’t look at me any differently, sexually or emotionally. He still loves me the same, I know that. I’m no longer obsessing over food or crying in the mirror because I hate my reflection so much. I’m looking in the mirror and appreciating things I never gave a second glance at before. Being put through such a life changing experience (and having been given no choice in the matter before hand) has bought out the best in me. I’ve become someone I like. I’m calm. I’m happy. I look back and I don’t understand how I could ever just “be” beforehand. I lived in a world of self-torment, self-hatred and self-obsession. I was absorbed by the things I despised most about myself. Being given my ileostomy bag and knowing that I can either deal with it and accept it or hate myself even more, has led to me accepting myself. I finally accept myself. This ileostomy bag has made me. This dramatic change has given me a positive mentality, a confidence I never knew I had. It’s given me hope, it’s given me a chance to just be me. And that’s what I’m going to carry on doing. Being me. A fantastic, wonderful, me. I’d like to comment on why I didn’t have my ileostomy reversed. It’s a decision I do not regret. me to realise I was more worried than ever about locating the nearest facility. I couldn’t drive more than an hour without stopping, sometimes much less than that. Working was torture, as I’d have to excuse myself in front of a client to literally run to the bathroom. The decision was made for me when I developed a fistula and it became an emergency to do the ileostomy. Things were left in place so I could have the option to be reconnected. Once I got over the shock, it was a relief to be in more control. Sure, there’s a learning curve. I am no longer always looking for the nearest loo. That probably is the best thing about my ileostomy. I’m the one who can schedule things better. Best to you, and I want you to know that I’ve never been ashamed of my ostomy. So glad to know that you are being so supportive to others about this.